Hi! Here goes a selection of photos from the south of the island. As my previous post showed, Herm is covered in stunning beaches, but the south of the island rises up into cliff faces that, among many other types of bird, house the puffin nests that Herm is known for. I have managed to see puffins, although not to successfully photograph when they are so far away in the water! Here's a few pictures that give you an idea of how the path goes. 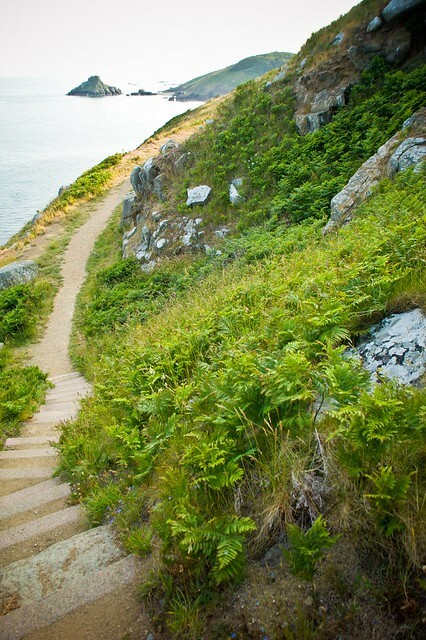 Then you can also see down into little coves, inaccessible by land, one of which is puffin bay but I'm not sure which! That bring you out to another favourite spot of mine where it opens out at what must be the south west tip of Herm where you can see Jethou Island and Guernsey further in the distance. The low sun in this picture really captures how I always see this spot on my walks after work! Finally, before going full circle and getting back to the front of the island and the harbour beach you reach Rosiere Steps, this is where the ferry docks at low tide. You can see them on the left. I'm still working on the inland stuff and I think I'll try a collection on fields and buildings next but you can't keep me away from the sea too long! Great photos Sarah. Nice to meet you on the island this week. I'm about to start processing my photos. I'll send you the link to my Flickr account when I've uploaded them. Keep the blog posts, and the photos, coming, and enjoy the Summer. Thanks Alan! It's always nice to meet someone who's seen my blog :) I look forward to seeing your pics.